The premieres of the R&B Christmas standard "Merry Christmas Baby". This live 31 Dec 1980 version of the song was released in November 1986 as the B-side to the WAR . The song was played in its E Street Band arrangement. With Tim McLoone's Holiday Express. Tim McLoone is a restaurant proprietor and founder of Holiday Express, a volunteer, non-profit and non-sectarian organisation dedicated to bringing music, gifts and holiday cheer to those less fortunate. Guest appearance with Tim McLoone's Holiday Express. Also present are Joe Piscopo, Bobby Bandiera, and Gary U.S. Bonds. With no Asbury Park Holiday shows planned that year, Bruce Springsteen made a guest appearance on Late Night With Conan O'Brien on 11 Dec 2002. The taping took place in Studio 6A in the GE Building of the Rockefeller Center. Backed by the E Street Band, and with some help from the show's house band the Max Weinberg 7, he delivered one of his best television performances. Holiday Shows. Bruce Springsteen & Friends performing two shows; one at 4:30pm and another at 8:30pm. Bruce makes an unscheduled appearance at Bobby Bandiera's Hope Concert. On the bill are Bobby Bandiera's Jersey Shore Rock-N-Soul Revue, Jon Bon Jovi, Southside Johnny, Gary U.S Bonds, Brian Fallon, Nicole Atkins and Tim McLoone and the Shirleys. Final show of the 'working on a dream' tour, the longest at 34 songs and nearly three-and-a-half hours. Bruce's first album Greetings From Asbury Park, NJ is performed in its entirety, dedicated to Mike Appel. 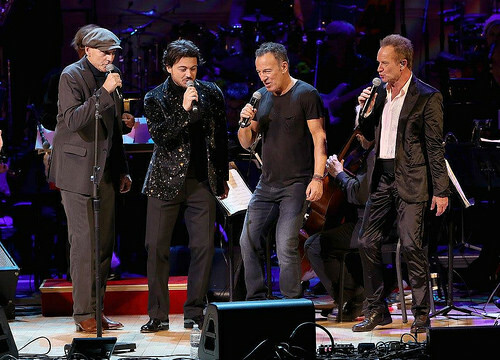 Bruce performs at the 27th Rainforest Fund Concert. Springsteen's set is comprised of three songs backed by the house band that includes a large symphony, opening with "Santa Claus Is Comin' To Town" while walking in from the back of the theatre. Bruce remains on stage for the closing numbers, but doesn't provide lead vocals. Other artists at Sting's biennial fundraiser include Darlene Love, Ronnie Spector, James Taylor, Idina Menzel, Vittorio Grigolo, Jennifer Nettles, and Sting himself. "Merry Christmas Baby" is an R&B Christmas standard credited to Lou Baxter and Johnny Moore and originally recorded in 1947 by Johnny Moore's Three Blazers, featuring the singer and pianist Charles Brown. Charles Brown tells the story this way: "Leon René had Exclusive Records. They needed a song; Bing Crosby had "White Christmas". Lou Baxter, who was a songwriter and used to hang around Johnny Moore and the Blazers, said 'Charles, I want you to do one of my songs because I need money.' He had to have an operation on his throat, he had throat cancer. If we did one of his numbers they would give him a $500 advance. So I looked in the satchel, I took the satchel (of songs) home that night and I looked in there, I looked at all them things, and it didn’t impress me. I saw "Merry Christmas Blues", but the idea struck me. I said this would be a good idea, but it wasn’t like what he had written. I wrote the title "Merry Christmas Baby", and I wrote the words, how I was going to sing it, and I mapped it out, played the piano, and I presented it to Johnny Moore. We didn’t know it was going to be a great big hit, but I thought it was unique. Leon Rene said put the celeste on it. I had never played one. He said it's just like the piano, put it on the side of the piano. 'Cause they didn’t have all these synthesizers. He said just play it (on the intro) like you play the piano then get back to the piano. Exclusive never paid copyrights. Hollywood Records took over, lawyers for creditors said artists would get their money, but it never happened. Don Pierce [Hollywood Records] never paid a nickel. Charles lost his letter. When Exclusive Records was sold, the artists/creditors got nothing. Leon Rene promised the artists the money would come. Never happened." And Johnny Moore did the deal with Lou Baxter and put his own name on it as well, apparently. Johnny Moore's Three Blazers was one of the hottest blues attractions on the West Coast when their recording of "Merry Christmas Baby" reached number 3 on Billboard's R&B Juke Box chart during the Christmas season of 1947. 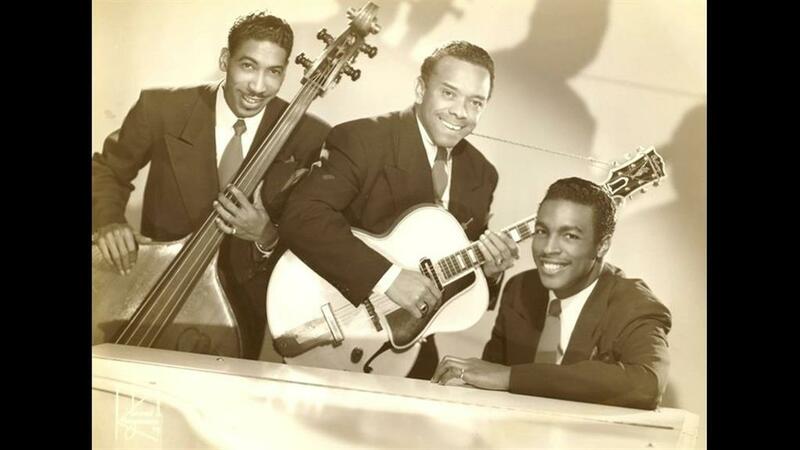 Moore, a guitarist, was accompanied by Brown, bassist Eddie Williams and guitarist Oscar Moore (Johnny's brother, then a member of the King Cole Trio).